The Pakscan™ Classic redundant loop network has been the network of choice for actuator control for over 30 years. Using robust current loop technology, up to 20 km loop lengths and 240 field devices are possible. Redundant loop ensures plant operability in the event of cable break or earth fault. Each actuator field control unit has a loopback circuitry that switches in the event of a fault providing continued loop connection on the 2-wire system. Current loop technology provides high noise immunity. Standard low cost twisted pair instrumentation cable (one pair) is required for the network loop and there are no requirements for external repeaters or network termination. Utilising 'Report by Exception', provides efficient data reporting at low baud rates required for long distance current loop communications. Up to 20 km loop lengths and the control and monitoring of up to 240 devices are possible with no limitation on the distance between devices. 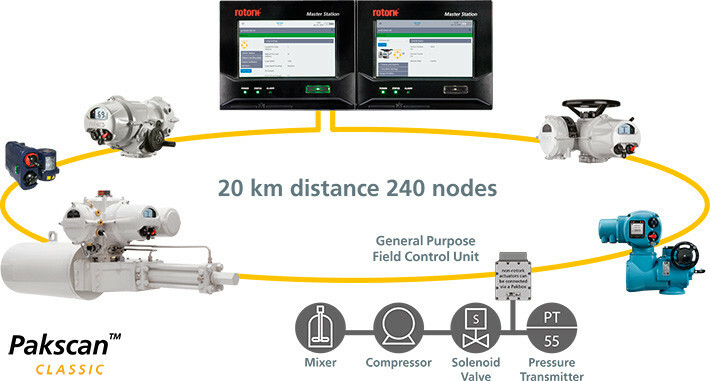 Actuators can be used as a hub or a dedicated General Purpose Field Control Unit (GPFCU) can also be used as digital and analogue I/O, providing the interfaces to connect other actuator types and additional plant control devices into the network.